One of the places my mother and I liked to go on vacation was Disney World. When we were there, we could forget about the real world. My mom would forget about her medical treatments. I didn’t have to worry about appointments to keep or meetings to get to. But we both knew we’d have to return to our ordinary lives. This is what happens in our Gospel today. 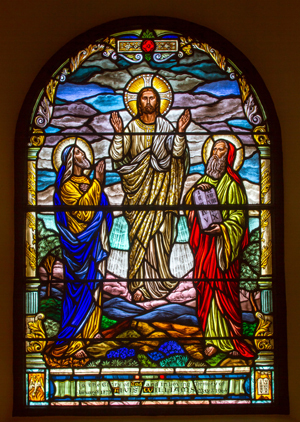 The three apostles see Jesus transfigured before their very eyes. It was an experience they would never forget. It was a time of peace, serenity, and joy. They didn’t want to leave, and that’s why Peter wanted to set up three tents. He and the others didn’t want to go back to the problems of the world. Yet Jesus told them they must go back. He came to show us how to live his life not on a mountaintop or at Disney World but with one another in the real world, with all its problems. My brothers and sisters, we are called to live the life of Jesus, not a life of isolation in a place of peace. At times, living with one another will be hard and messy, but that’s where we will meet Jesus. That’s where we will experience his love, mercy, and forgiveness. That’s where we will meet Jesus himself. During this Lent, let’s resolve to live Jesus’ life in our communities, with one another. May Jesus the Holy Redeemer walk with us this Lent.